One of the most successful franchises in professional sports history, the New York Yankees have won 18 division titles, 40 AL pennants, and 27 World Series championships, all of which are MLB records. The 1961 New York Yankees season was the 59th season for the team in New York, and its 61st season overall. The team finished with a record of 109-53, eight games ahead of the Detroit Tigers, and won their 26th American League pennant. The Yankees played their home games at Yankee Stadium. In the World Series, they defeated the Cincinnati Reds in 5 games. 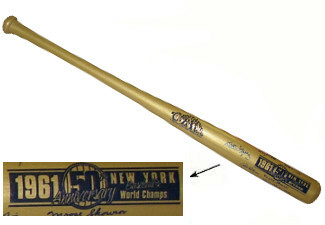 This New York Yankees 1961 World Series Champs Cooperstown Engraved Gold Bat has been signed by Al Downing, Tony Kubek, Hector Lopez, Art Ditmar, Moose Skowron, Jim Coates, Bobby Richardson, Bob Turley and Luis Arroyo. MAB Hologram and Certificate of Authenticity from Athlon Sports.